Immerse yourself in your music with premium, wireless, on-ear ANC headphones with Bang & Olufsen Signature Sound, luxurious materials and a streamlined, lightweight design - ideal for your daily commute or longer journeys. Two microphones, one placed on the outside of the ear cushion and one placed on the inside, just in front of the speaker, effectively cancel out unwanted noises. B&O PLAY have updated their classic H8 with a contemporary look, enhanced voice quality and added features including proximity sensor and Transparency Mode so you can tune into your surroundings. With an impressive battery life of up to 30 hours playtime, you can enjoy your music all day. The perfect match of style and function, H8i are one of the lightest in its class, giving you optimal comfort. You simply won’t want to take them off. 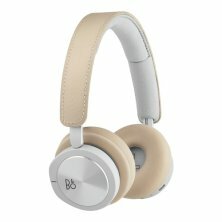 Premium, wireless, on-ear ANC headphones with Bang & Olufsen Signature Sound, luxurious materials and a streamlined, lightweight design - ideal for your daily commute or longer journeys.